I have been working at Terrington since we first opened in 2000, I am now the head nurse. 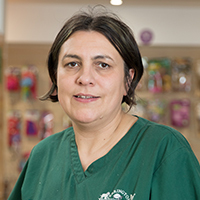 I love running nurse clinics and have had great success with my pet obesity clinics, I am a Royal Canin Advanced Pet health counsellor. I also enjoy hand rearing puppies and kittens, just not so good at re-homing them afterwards, I now have 7 dogs, 4 French bulldogs, 1 pug, a Labrador and a spaniel, I hand reared Sherman, and Narla. I am married with 2 children, in my spare time I enjoy riding my horse William and I am also a community responder.